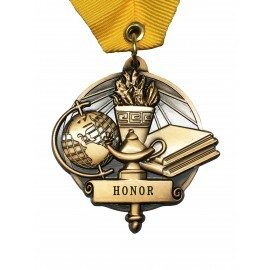 Order your Elementary Graduation Honor Medals from Gradshop and we can have them shipped to you on the same day. Choose from our outstanding selection of custom school medals as well as unique valedictorian medals. Present the ultimate symbol of accomplishment and success to deserving graduates with Gradshop's Elementary Graduation Honor Medals. What's more, you can take advantage of huge savings anytime you order in bulk so get in touch with our friendly staff today to get major savings without compromising quality and style.